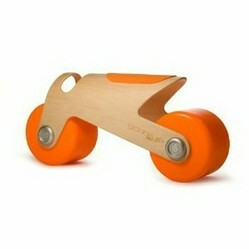 The Kid-O Bit Bike was named one of Parenting Magazine's 2011 Toys of the Year, read on to find out why. We bought a Kit-O Bit Bike for my daughter for the express reason of encouraging her to walk early. Our other children were late walkers, and we didn't want for her to wait until she was 18 months old to begin toddling. So, after doing some research on encouraging children to develop balance, we purchased the Bit Bike, in pink of course. She was a bit reluctant at first to get on, but we had one of the other children model how to use it, and that was all the encouragement she needed. At first, she just sat on it and held on, but as she became more comfortable she started to scoot back and forth. One day, about a week after she first got on, she took off and really started having fun. I can't say for sure if the Bit Bike was the one thing that encouraged my daughter to begin walking at an earlier age than her siblings, but it was definitely the toy she enjoyed the most. It became difficult to get her to do anything else, she loved the bike so much. The bike held up very well too, even with older siblings occasionally taking it for a spin. We are going to hold on to it, in case we end up having another baby. It still looks like it is new, and the wheels were easy to clean off when they got dirty. You can choose three different neon wheel colors for your child's bit bike. The bike comes in neon orange, neon pink, and neon green. If you want the pink bike, you are in luck because it sells for about twenty dollars less than the other two bikes on Amazon. The Kid-O Bit Bike was just named one of Parenting Magazine's Top 25 Toys of 2011. The Bit Bike was designed to help children, aged 12 months and up, develop balance and gross motor skills. The Wheels of the Bit Bike car are wide, and it is set low to the ground. The ergonomic design encourages your little tyke to lean over and steer the bike wherever he wants it to go. The bike will gently encourage your child's coordination as he learns to maneuver around your house or driveway. The bike is made from wood, aluminum and the wheels are made from EVA or ethylene vinyl acetate, which is a nice squishy, rubber-like material. You can be confident that the wheels will not scratch your hard-wood or tile floors. 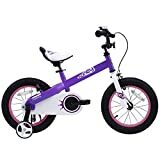 The Kid-O Bit Bike also comes with a carrying case, and at just over five pounds, you will feel comfortable throwing it in the back of the mini van and taking it to the park. Two year olds love to explore new textures, colours, toys. The Eric Carle Gallery lets them do that freely and safely.